November 14th, 2012 was the important day I had been waiting for. I had worked especially hard during the last two months (in addition to the past three years) to have finally reached the moment my larger-than-life sculpture would be shown to Shawnigan Lake School. Headmaster David Robertson and director of Advancement Rudy Massimo joined myself and Stuart Milbrad in the studio (currently at Real Carriage Door Co.) to see the substantially complete sculpture of founder and first Headmaster of Shawnigan Lake School: Christopher Windley Lonsdale. My favorite photo of Lonsdale. 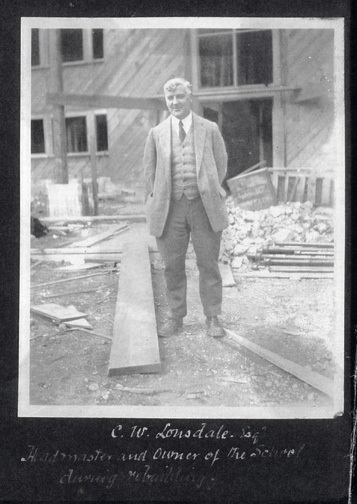 Here he is pictured in front of the school shortly after the fire. We discussed the Work for nearly two hours. I described to them the process of making the piece, the thoughts behind it, and what I imagined Lonsdale to be thinking about as he stood (in my mind) looking out over his school campus in the year 1925. We thumbed through all the archival photographs of Lonsdale on my iPad (I've memorized them all by this point). I pointed out various characteristics about him in each photo and the inspiration for the piece. The Work was received with much enthusiasm, and it was a pleasure to create such a work, knowing that even alumni who were personally acquainted with Lonsdale will get a chance to enjoy it, as well as current and future alumni.